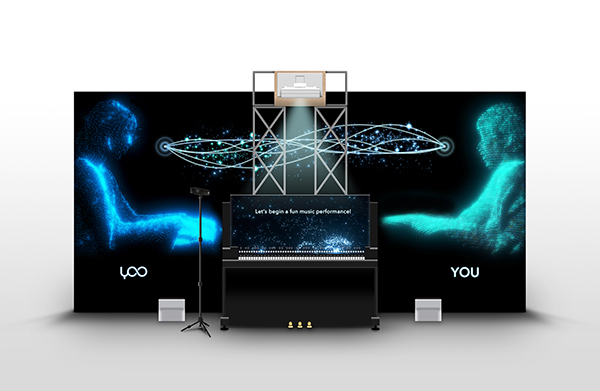 Yamaha and HAKUHODO i-Studio Exhibit Experiential AI Music installation "Duet with YOO" at 2018 SXSW. Hamamatsu / Japan (March 01, 2018) – In collaboration with Yamaha Corporation, HAKUHODO i-studio will exhibit an experiential installation "Duet with YOO" equipped with the Yamaha AI Music Ensemble System at Booth 1325 of the 2018 SXSW in Austin, Texas from March 11 to 14. The display presents a new role for musical instruments in an AI system bringing the joy of playing in a music ensemble to any musician. Yamaha has worked on different music AI activities including concerts using its proprietary AI Music Ensemble System and these innovative performances have been well received. As a next step, HAKUHODO i-Studio and Yamaha decided to realize the "Duet with YOO" installation to allow musicians to interact directly with music AI and gain a better understanding of how AI can enhance their performances. 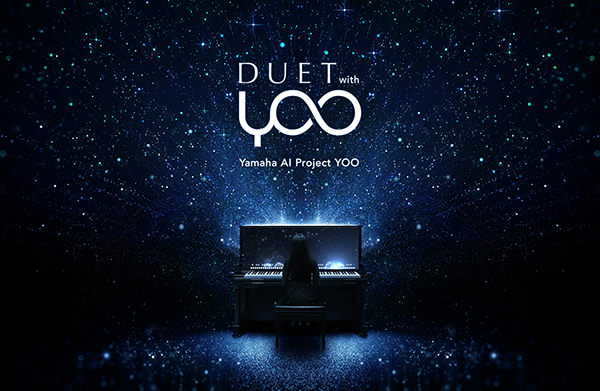 Yamaha and HAKUHODO i-Studio developed "Duet with YOO" to create a new musical and visual experience to expand the potential which every musician has within them. It provides an interactive AI experience where a musician feels like they are playing with another musician. The Yamaha proprietary AI Music Ensemble System instantly analyses a musician's performance in real time, and predicts suitable tempo, timing and dynamics to create a harmonized ensemble on a Yamaha Disklavier piano. As you play, YOO beautifully accompanies your performance. In addition, the "Duet with YOO" installation visually expresses synchronicity between you and YOO by coordinated on-screen displays. This is made possible by HAKUHODO i-studio's technology and imagination. Along with Yamaha Music AI technology, it creates a unique next-generation music ensemble experience. Participants can experience "Duet with YOO" through their performance of "Twinkle, Twinkle Little Star". This song was chosen because it is very well-known and relatively easy for beginners to play allowing almost anyone to experience music AI. The YOO exhibition will be on display during the SXSW trade show at booth 1325. Yamaha AI Music Ensemble System has the ability to mimic what humans would naturally do when in a music ensemble. We believe that AI will become a bridge between human beings and musical instruments. We are continuing our AI development activities to enable human beings to have more expressive and fulfilling experience with a musical instrument. HAKUHODO i-studio is a digital production company under HAKUHODO DY Group, the seventh largest advertising group in the world and the second largest in Japan. HAKUHODO i-studio provides high quality and one-stop support in planning and developing corporate, promotion and campaign websites as well as consulting, PDCA management and localization services to clients in Japan, China and ASEAN countries.